The KTM Duke 390 is a city bike made in India featuring a 373cc single-cylinder thumper producing 43hp and 26lb-ft in a svelte 338 lbs ready to ride frame. Front and rear discs, ABS, steel trellis design not unlike the ducati hypermotard peaking out from behind the Duke (spoiler alert: a much better bike to nobody’s surprise), a 6 speed transmission, and upside down forks. At 31 inches the seat height is the first thing I noticed about the Duke. At a mere five-foot-six mounting the duke... “mounting the duke”. Might want to phrase that better. Climbing on board the KTM takes a bit of finesse but the light weight makes it easy to tippy toe around and back up because flat-footing simply was not going to happen. The seating position is pleasingly neutral and approachable and the bike as a whole is the absolute epitome of “easy to ride”. Whiskey throttle it all day; this thing won’t get you in trouble. An energetic launch from a stop light was met with intense pucker upon buzzing past a police officer sitting in the oncoming lane until I looked down and realized that my 3 gears of twist had yet to break the speed limit. The engine doesn’t make torque nor does it have an exciting surge of power towards the top end. It is bland throughout the rev range with a thoroughly uninspiring exhaust note that feels a bit like abusing a weedwhacker. I am pleased to report that you can clutch up and point the nose skyward in first gear, however, thanks to the bikes utter lack of weight. The transmission encourages enthusiastic riding but not in a very good way. On any sort of sporty bike and most cruisers clutchless shifting is pretty much the norm. Newer Harleys, my every Kawasaki I’ve ridden, Ducati, etc. will easily slip into the next gear with a bit of upward pressure on the shifter and a blip of the throttle. The KTM is especially temperamental about this. The special sauce seems to be the upper 1/3rd of the rev range, VERY aggressive cutting power to get the trans to click into the next gear. More often than not I just found myself using the clutch as I’d find myself coasting and slowing down as I tried to convince the transmission to grab 3rd. So obviously the 390 isn’t a straight line warrior nor is it especially well suited to the Midwest’s highways with its feather weight that would get blown to Canada in a stiff breeze. What it is meant for is squirting around town breezing through midnight neighborhoods and parking garages while drum-and-bass plays from the bluetooth speakers attached to some guys Grom, and it does this with aplomb. 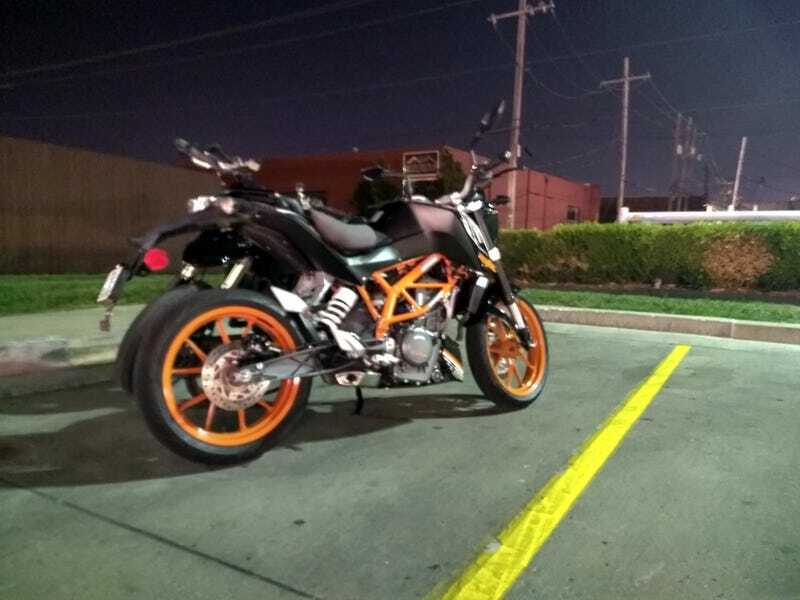 The KTM is easy to ride and even easier to live out your Valentino Rossi fantasies at 10mph leaning deep into corners as the bike urges you “come on, just a little tighter. You can do it” as you flick the bike into the next corner. This experience is pretty great! But only for short periods of time. After 40 minutes the incessant vibration of the 390 single had rendered my hands and my wife’s favorite bits utterly uncommunicative with my brain and feeling took some time to come back. Overall the Duke is a neat thing to borrow for a quick ride around town but I can see very little reason to own one. There are better beginner bikes and there are far more useful bikes for much less money.